You are not logged in. [Log In] Pond Boss » Forums » PHOTO GALLERY » Image Gallery » Crayfish monster. 18 registered (gehajake, FireIsHot, Bocomo, teehjaeh57, wannapond0001, Bill Cody, gregory, ryjohn, Tbar, Criegg, rjackson, John Fitzgerald, Jim Wetzel, bigbambo, Zep, Theo Gallus, ArmyPT, Mike Whatley), 198 Guests and 171 Spiders online. This is a crayfish we just had walking by on the shore while my wife and I were sitting down at the pond the other night. Dono, awesome pictures. I think the perch is the monster here! That thing is huge and fat! How do you get them to glow yellow like that? You must feed them with the good stuff! I wonder what type of crayfish that was? certainly he or she was a beauty as well. I stocked spotfins just a few adults who were colored up and ready to spawn but I didn't see any spawning last summer. I put them in I think in late June when water was getting close to spawning temp (70). I put out lots of structure with crevices but never saw them again. I think I put in like 25 male and 25 female. The GSH are reproducing well but I'd love to get a stable population of spotfins too. Maybe the spotfins can't swim away from my perch as fast as the GSH? 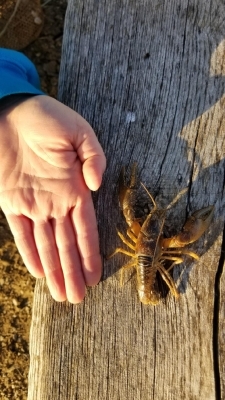 I think yours beats me by a few ounces, but thought I'd share what my daughter exclaimed was a "lobster" when she saw it the other day. Lol! Great perch by the way!!! Man that is a nice home grown perch! I assume you pellet feed high quality food? Also do you find that keeping your water cooler helps to keep your perch feeding the surface? I’m in Indiana and it helps to run my aerators for 5 minutes before I go to do a manual feeding. This pulls the cool water from the deep and dispersises it throughout the water column encouraging the perch to feed better. I discovered this by accident and have used it as a way to get my perch to feed pellets off the surface later into the summer. I only aerate my pond at night so I’m able to keep it cooler than I need and can turn over the cold water for a short period of time in the evening just to allow the perch to feed better and longer into the season. However come July or August eventually it just gets too hot and they stop feeding on pellets for the season. I assume you are further north than central Indiana?! And what insight can you give on growing perch like that on small BOW?! Yes the food is good and it helps to have a setting sun lighting up the fish. This was taken after we had them off feed for about 60 days. It was Dec 8th. The shiners are doing very very well. Our Emerald shiners are re populating still. The boy caught 4-6" emeralds and 2-2" emeralds in the minnow trap last night. Many common shiners. I as a kid would call them horned chub. The adults have horns or hooks on their head. The common shiners are warmer water shallow water minnows. The emeralds are deeper water not near the shore as much so our minnow trap needs to be deaper to catch them. AquaticsFanatic I have been able to keep the perch on the feed all year now with controlling our aeration. Right now our water is in the 47 range so we run the air in the day 12 hours 7am to 7pm. Think we will put the feeder out this weekend. Once the water temp is at 55-60 we run the air at night 7pm to 7am. The cool night air lowers the temp of the pond. Running it like this has kept our perch on the feed from May till Oct.